Adding fresh crushed garlic to your favorite dishes brings an elevated level of aroma and flavor to your cooking and dining experience. Fresh garlic is heart-healthy too. 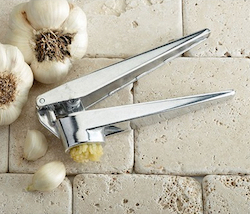 With the Ghidini garlic press you can easily crush cloves with one hand. For clean up, simply hand wash, then dry thoroughly before storing away in your gadget drawer.